Links to this page can be found in Book 5, Map C4, Day 5, View C12 and Rione Ripa. 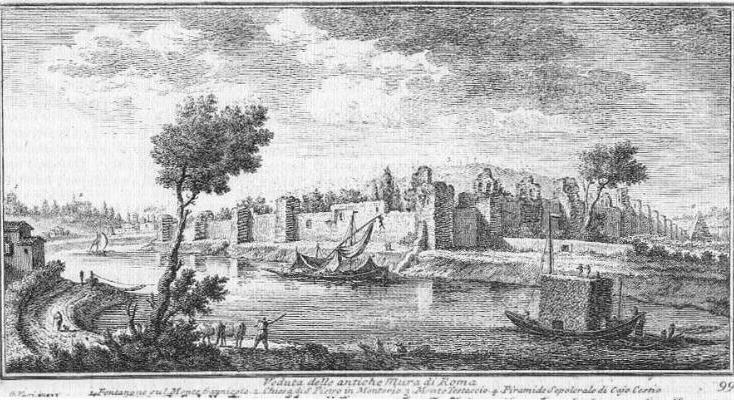 This fine view of the ancient walls of Rome which Giuseppe Vasi included in Book V (published in 1754), was most likely engraved some ten years earlier for Vedute di Roma sul Tevere, the first book of etchings by Vasi; this explains its size, which is smaller than that of the other plates, and its landscape format. The view is taken from the green dot in the small 1748 map here below. In the description below the plate Vasi made reference to: 1) Fontanone dell'Acqua Paola; 2) S. Pietro in Montorio; 3) Monte Testaccio; 4) Piramide di Caio Cestio. 1), 2), and 4) are shown in detail in other pages. The small map shows only 3) and 4) because 1) and 2) are very distant from the site shown in the etching. The area shown in the plate was significantly modified in the late XIXth century by the construction of a large slaughterhouse, by the redesign of the river bed and by a railway bridge across the river (the photo shown above was taken from a train). 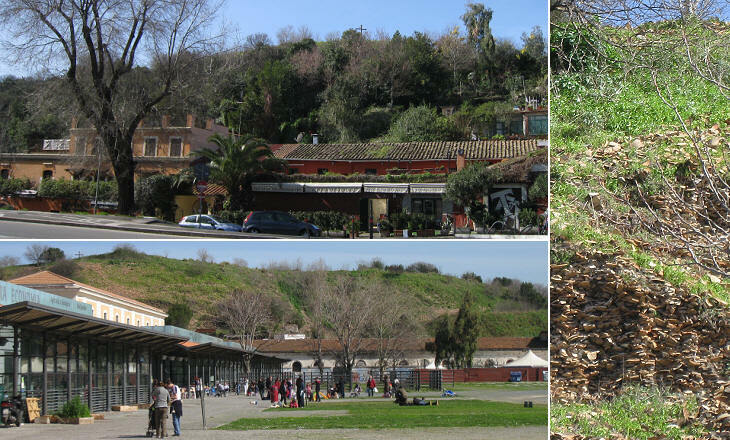 Monte Testaccio, the artificial hill made up of broken testae (ceramic vases used for the transportation of olive oil) was rightly regarded as an archaeological site and it was almost unaffected by these changes and by the development of Testaccio, a modern quarter. Olive oil was a key commodity for the ancient Romans; apart from its use for cooking, it was utilized as fuel for the oil lamps which lit the city nights. Approximately at the time of Emperor Antoninus Pius or some time earlier, oil supplies mainly coming from Spain and northern Africa were carried to the warehouses along the river in a particular kind of testae; unlike the most common ones (see image used as background for this page) these pots had a much rounder shape, which made reutilization of them impossible after they had been emptied of their content. The testae were broken and piled up in an orderly fashion in an empty space behind the harbour warehouses and lime was sprinkled to stop fermentation of the oil left in the pots; seals and painted labels have allowed archaeologists to identify the origin and date of the testae; records indicate that the last vases were dumped in 251, probably because after that year the storage of oil was relocated from Rome to Ostia. 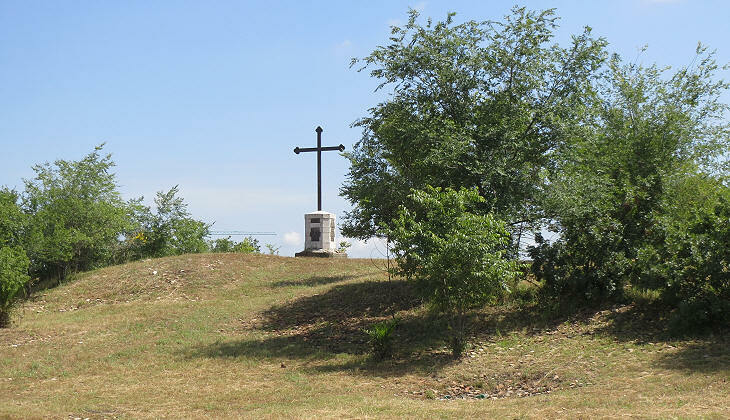 At the time of Vasi there were three crosses on Monte Testaccio because the site was used for the re-enactment of the Passion of Jesus Christ. The procession started at Palazzo di Pilato. The three crosses can be noticed in another etching. 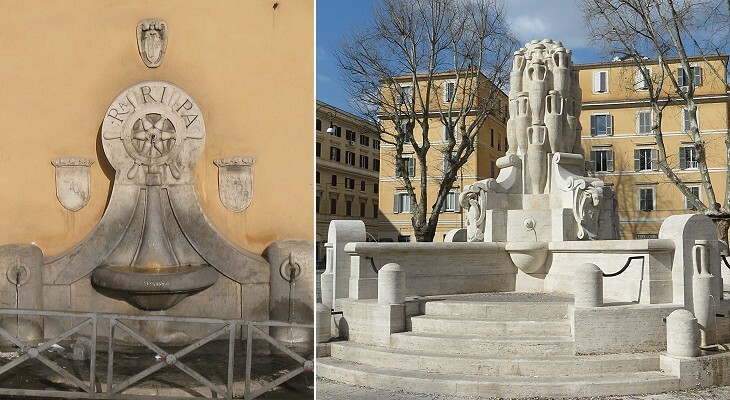 In 1921 the modern quarter of Testaccio was detached from Rione Ripa and it became a rione of its own, an event which was celebrated by a fountain showing many testae. The fountain of Rione Ripa was quite erroneously moved to Rione Trastevere. Porticus Aemilia stood behind the warehouses of the river harbour. It was a very long building (more than 500 yards) and it was divided by pillars into fifty sections each of which in turn had seven rooms. It enabled the accurate storage of all the commodities which were unloaded at the river harbour. Its initial construction is dated early IInd century BC. It was also known as Emporium and today's Italian emporio means a large shop selling a wide variety of goods and The Emporium was a department store chain having its headquarters in San Francisco, California, which operated for 99 years. 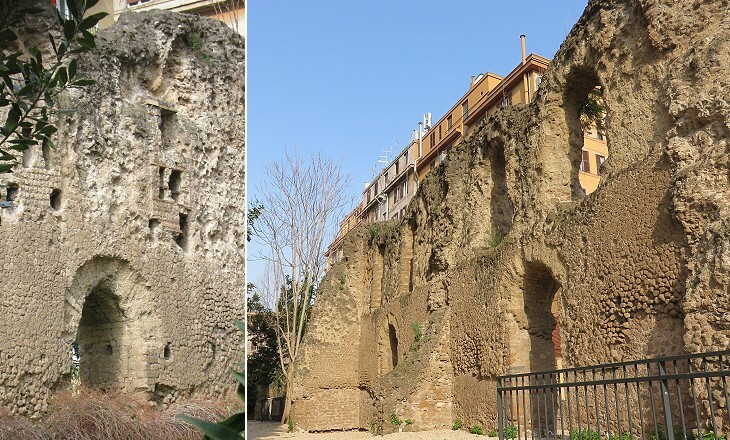 The construction of Porticus Aemilia was followed by that of Horrea Galbana a century later. Horrea means warehouses, but it also indicated a marketplace. They consisted of three long parallel courtyards with some eighty shops each. Unlike Porticus Aemilia there are no remaining standing walls of Horrea Galbana, but a number of tombs of people who worked there have been found. 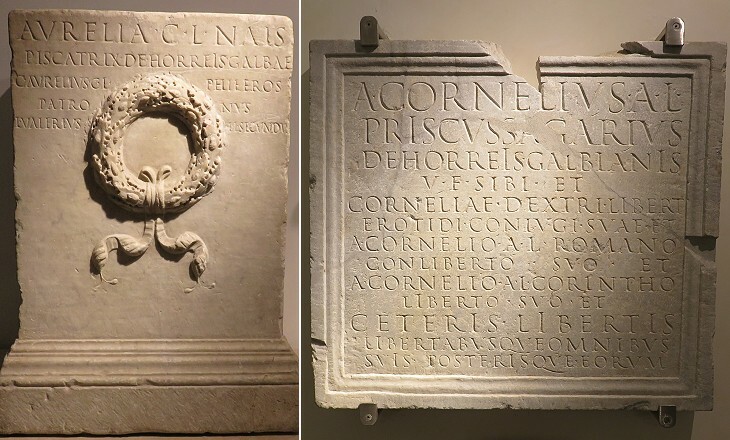 The ancient Romans were proud of their trade and the inscriptions on their gravestones do not tell us how pious or brave they were, but how they contributed to society, even though they did a humble job. 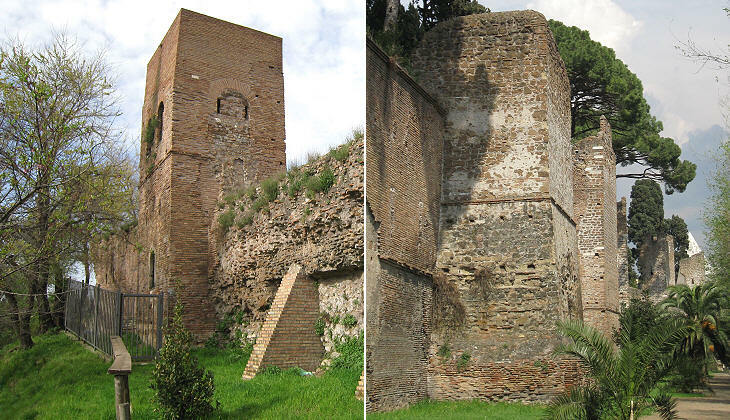 The walls along the river were pulled down when the bank was redesigned, while those leading to Piramide di Caio Cestio were preserved to a large extent; a section of them however cannot be visited because it is inside private properties. Today the walls protect the historical Protestant Cemetery of Rome and the modern Commonwealth War Cemetery. Next plate in Book 5: Monastero di S. Paolo fuori le mura. Next step in Day 5 itinerary: Monte Aventino e Vestigi del Ponte Sublicio. Next step in your tour of Rione Ripa: S. Maria del Priorato. Molto in uso furono negli antichi tempi i lavori di creta, credo io, perchè non era ancor in tanta copia lo stagno, il rame, e l’argento, come nei nostri secoli si vede; perciò ne formavano non solo le tegole, le pentole, ed altri utensili di cucina, ma facevano ancora maravigliosi vasi, urne sepolcrali, e statue, ornandone tempj e prospetti di case magnifiche; onde il Re Numa ai sette collegj, che erano in Roma aggiunse quello de' siguli, e per comodo loro assegnò ad essi il luogo vicino al Tevere, tanto per prevalersi delle acque, quanto per buttarci gli avanzi inutili; ma accortosi il popolo Romano, che a poco a poco si sarebbe impedito il corso delle acque, fu decretato, che non più nel Tevere, ma nel sito, ove ora vediamo il monte si gettassero i rottami de' lavori di creta, che testa dicevasi in latino. Fu perciò in tal modo accresciuto il masso, che si formò un monte alto 160. piedi, e di circuito un terzo di miglio, e dicesi corrottamente monte Testaccio: vi erano ancora i vetrari, e i legnajuoli. Ultimamente poi vi sono state incavate delle grotte per conservarvi del vino, che vi si mantiene freschissimo: onde nell'estate vi concorre del popolo a gustarlo.